Is your church website going to be ready for Easter? Here’s one chart that shows why it matters. 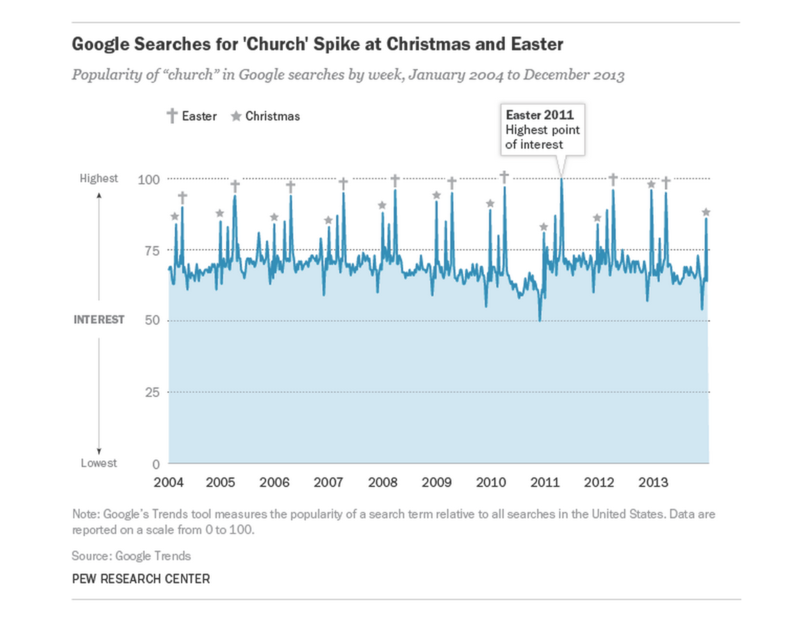 On Google, the word “church” is searched for the most often around Easter. It’s no surprise to church leaders who see the attendance spike, but it’s a reminder that you have to make sure your church’s online presence is ready to make a good first impression. Make service times and location easy to find. This is a year-round tip, but even more important on weekends where there are extra services or shifted times from the normal schedule. How will people join you if they don’t know where you are and when you’ll be there? Give a preview of what people can expect on Easter weekend. When folks are picking a church to visit, they’re looking for a comfortable fit. Eliminate any unneeded surprises. Share what the services will be like in tone and message. This is all about removing barriers for visitors so they will actually come to your building. Show your church in action. Beyond Easter festivities, give a feel for who you are as a church. What do you stand for? How are you serving your community? How are lives being changed as you connect people to Jesus? Your website is your digital front door, so have a site that welcomes people and reflects what they’ll see when they visit you in person. Make follow-up easy. Make it clear how people can contact you if they have any questions. More importantly, make sure you’re ready to respond. If you have a “contact us” email link it better end up in an inbox where it will actually be seen. Also, equip your front line staff with the information they need to answer Easter questions in an educated way. This is a key in turning an online relationship into a personal one. Don’t get overwhelmed. Reading this list might fill you with panic. You have a lot going on at Easter and a complete website remodel doesn’t need to be rushed onto that list. Think of practical ways you can get your website ready. Adding images will go a long way. Being intentional about organizing Easter-related information is good, too. Even small improvements will make a difference in helping people connect with your church.